Man drinks nine shots of vodka before driving in Sebastian, Florida. SEBASTIAN – Police received a call about a drunk motorist Monday night parked on the sidewalk in front of the Speedway gas station at 700 U.S. Highway 1 in Sebastian. Sebastian Police arrived and observed a black Jeep parked at the gas station. A witness said the driver of the Jeep failed to stop at the red light before parking, according to the report. The driver of the Jeep, identified as 28-year-old Joshua Bond, was “slumped over the steering wheel,” the affidavit said. Officers then made contact with Bond and observed red bloodshot eyes and recognized a “heavy odor” of an alcoholic beverage as he spoke, the report said. Bond told police that he’s “usually not this fu**ed up” and agreed to submit to standard field sobriety tests. It determined that he was too impaired to drive. “Bond stated that he drank nine shots of vodka approximately one hour prior,” the officer said. Bond provided police with two breath samples. The results were 0.341% and 0.348%, over four times the legal limit. 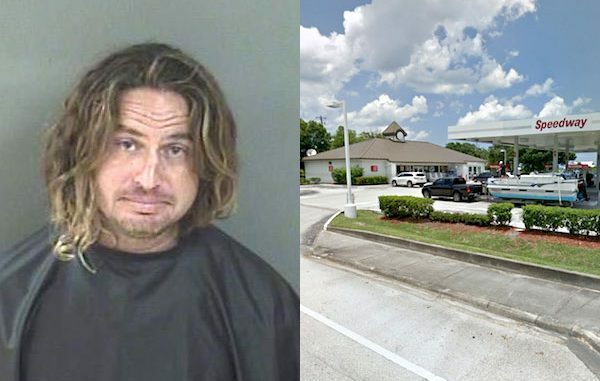 He was arrested for DUI and transported to the Indian River County Jail.